Slide numbers in a Powerpoint 2013 slideshow provide a helpful method of keeping track of where you are in your presentation. But you may encounter situations where the slide numbers are distracting, or you are printing the slides and reorganizing them in a way that makes the slide numbers confusing. 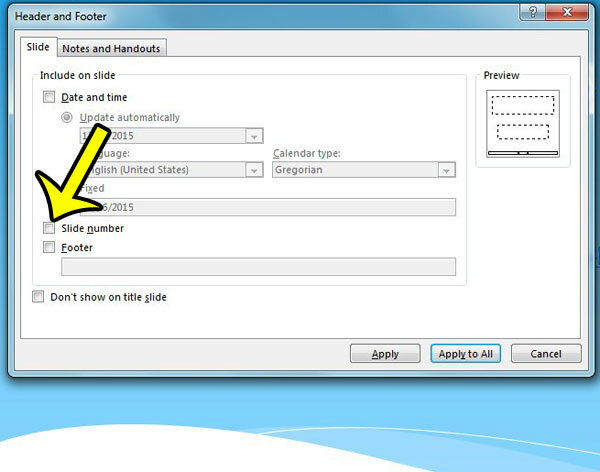 Fortunately slide numbers are a customizable setting in Powerpoint 2013 presentations, and you can choose to remove them. Our guide below will help you find the slide number setting so that you can turn it off, if you so choose. The steps in this article will remove the slide numbers from all of the slides in your presentation. However, you can choose whether there is a page number at the bottom of each individual slide in your presentation by following the steps below, but clicking the Apply option instead of the Apply to All option. You will then need to manually go through and adjust this setting for each individual slide. Would you prefer that your presentation was in the portrait orientation instead of landscape? 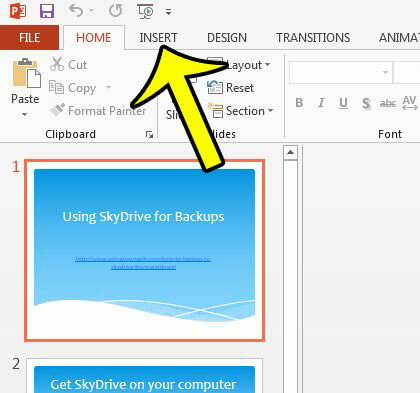 Change the slide orientation in Powerpoint 2013. Open the Powerpoint presentation containing the slide numbers that you wish to delete. Click the Slide Number button in the Text section of the ribbon at the top of the menu. Check the box to the left of Slide number to remove the check mark. You can then click the Apply to All button to remove the slide number from every slide in your presentation. As mentioned earlier, you could alternatively click the Apply button if you only wish to remove the slide number from the current active slide. Is there a slide in your presentation that you no longer need? 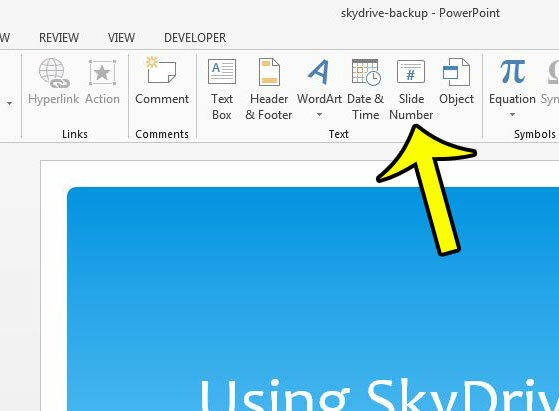 Learn how to delete a slide in Powerpoint 2013 to completely remove the entire slide from your presentation.